Deep in the carbon hollows of the internal structure of Land Rover BAR’s new boat banks of red, yellow and green LEDs wink away like a spaceship on standby. Underneath the boat, a green laser beam fires forward along the centreline of one of the hulls as a team of engineers check the alignment of the underwater foils. This is precision engineering aboard Ben Ainslie Racing’s latest flying machine, T2, their second development boat. There is no smell of styrene or epoxy, no screech of airline-driven power tools and no clouting of hammers and popping of rivet guns. In fact, this is no typical boatyard; it’s more like an operating theatre, with its quiet, calm atmosphere, only a few light hums in the background. You almost expect dry ice to billow through the gap in the shed doors as they open. 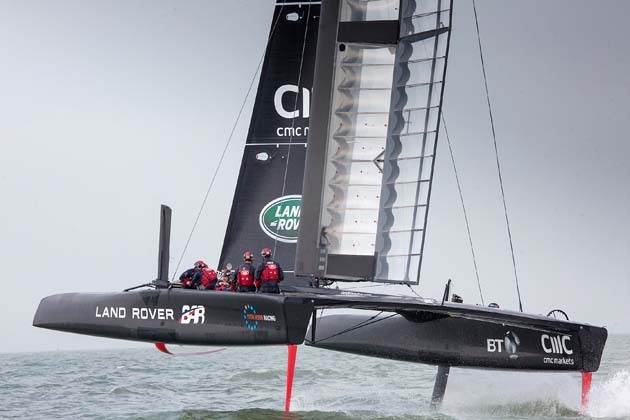 The newest addition to BAR’s growing fleet of hydrofoiling Cup cats brings the British team in line with two of their major competitors, Artemis Racing and Oracle Team USA, who have both had T2s for a while. When it comes to hours on the water with the new, more powerful machine, Ainslie’s team know they are playing catch up, but they also know how carefully they have to take each step. Getting to grips with a new, more powerful boat, which is controlled using human-powered hydraulics rather than control lines and winches, has presented a big challenge. Unlike the AC45fs where the crew haul ropes and hike, aboard T2 there is just one sheet on the whole boat, a wing sheet. Devoid of the normal battery of ropes, blocks and clutches, the new cockpit plays host to a network of bright stainless hydraulic piping and flat screen keypads set close to each work station, making the hulls look more like a McDonalds’ kitchen than a raceboat. Accumulators are not allowed on these boats, so if you want hydraulic pressure you have to pump it, by hand. Of the six crew, four spend their time grinding the two pedestals at a furious rate – it requires them to be working constantly at around 80 per cent of their maximum heart rate for 30 minutes. As they do so they are switching pumps on and off using either foot pedal controls in the cockpit sole, or tapping the control pads. 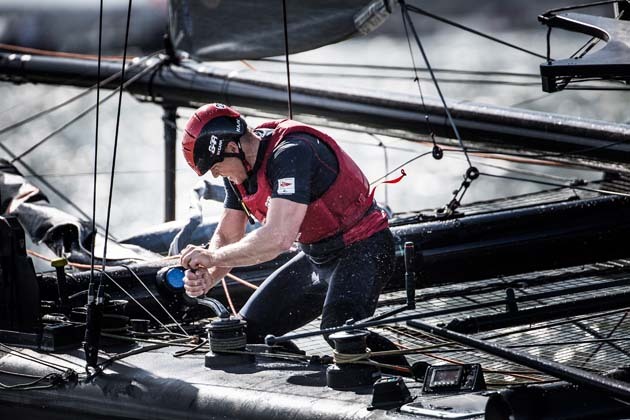 Getting used to such a high-powered beast, which offers barely any physical feedback, has not been easy and one of the main reasons why the team has decided not to go the whole hog and make the wing sheet – effectively the mainsheet – hydraulic. 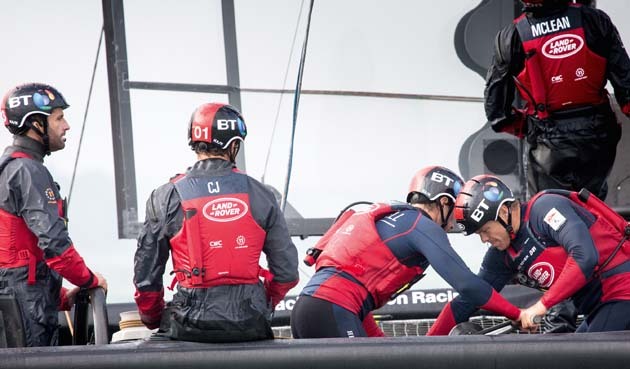 Yet while the crew get to grips with this new lack of feeling, a bank of technical experts ashore are experiencing the team’s boat like never before. Deep within BAR’s futuristic-looking base in Portsmouth lies one area that they are particularly sensitive about. They call it mission control. Based on a sophisticated telemetry system similar to that used by Formula 1 teams, technicians can monitor the boat’s every move as data from more than 300 sensors is streamed back in real time, from wherever they are. I had a digital intercom system that allowed me to talk to a whole range of technicians,” he explains. “I could talk instantly to, say, the tyre expert back in Woking at any time. This is clearly a far more efficient way of getting the right information to and from various people than hauling them around the world. 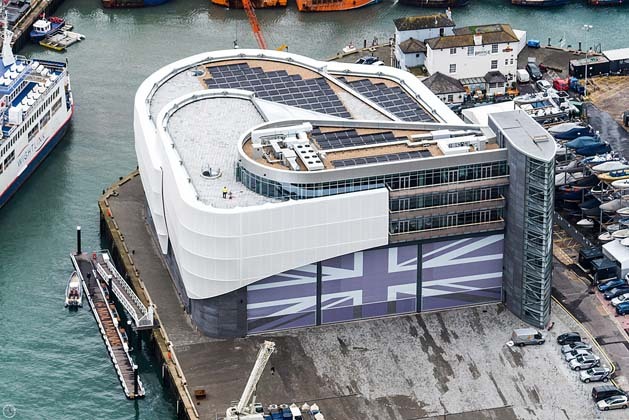 “We are developing that system in a room in this building so that whenever the boats are sailing, be it here in the Solent, or in Bermuda, we can communicate instantly. It’s convenient and of course it’s much cheaper. But in the recent AC World Series event in Bermuda the mobile phone network struggled to cope once the spectators showed up. Little surprise then that one of Land Rover BAR’s latest commercial partners is BT. Whitmarsh believes that there is a practical benefit to the long-range telemetry. Chasing the raceboats with support boats that access the data in real time means that RIBs might need to do 50 knots to keep up. “Its uncomfortable and sometimes impractical and you can’t fit all the technicians aboard!” Whitmarsh says. Beaming the information back to shore at the base allows everyone to see. Elsewhere in the building lies another impressive piece of technology that displays more links to the Formula 1 culture: a simulator. As always, time on the water counts for a great deal, especially aboard such powerful boats with their neutral feel. In such a situation, the relationship between the wing trimmer and helmsman is crucial. With a steep learning curve to climb and the winter weather throwing spanners into the works, the team has decided to build a sophisticated full-size moving simulator for the helmsman and wing trimmer. Riding high on a series of hydraulically actuated legs, the simulated cockpit moves in the same way as an aircraft or F1 simulator. 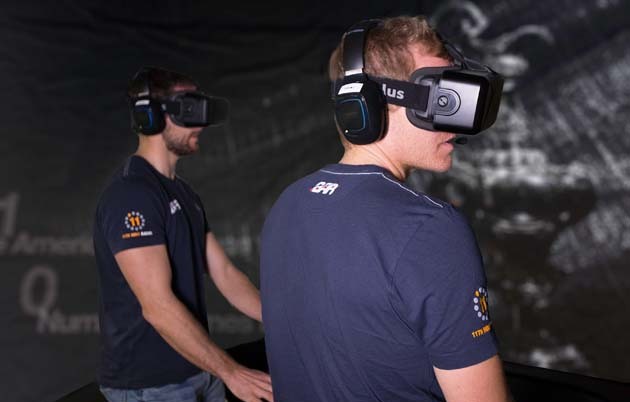 But instead of a giant screen, the helmsman and trimmer wear virtual reality headsets. Whitmarsh also believes that developing such sophisticated systems goes well beyond simply the technical needs of one campaign: “What we’re trying to do is not just to win the Cup, but to defend it and respond to a change in the sport. The America’s Cup has become a television product and something that can grow and develop. We are not relying on a billionaire benefactor at BAR; we’re a commercial programme. “We aim to be a team competing in a global sport and once you’ve done that, picking up 100 people and moving them around the world is pretty inefficient. So, you have to approach things differently.